Take a minute and introduce yourself (if you like), and tell us what you are flying or working on. I'm sure that the regulars from Australia will join me here. I have seen a couple of new aerobatic forums fizzle out in recent years, hopefully this one is successful. 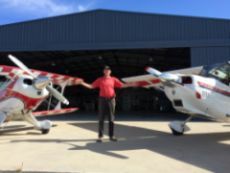 I've operated Pitts for most of my flying career; a "Laser" for over 20 years (competed up to Unlimited); a Std Decathlon and now a Super D.
Hi Dave, thanks for joining. We plan to be here for a while. Tell your friends, and start some conversations here. The plan is not to be just a 'Forum' ,but a resource, and you will soon see what we mean by that..
G'day Dave (and everyone else). Me and Lachy are finishing a build on a Z230. As soon as I get a few things out of the way I'll start posting some pics of the project! Looking forward to this forum thriving! Andymac wrote: G'day Dave (and everyone else). Me and Lachy are finishing a build on a Z230. As soon as I get a few things out of the way I'll start posting some pics of the project! Looking forward to this forum thriving! Welcome Andymac! Hope you enjoy your stay here. Looking forward to the pictures!